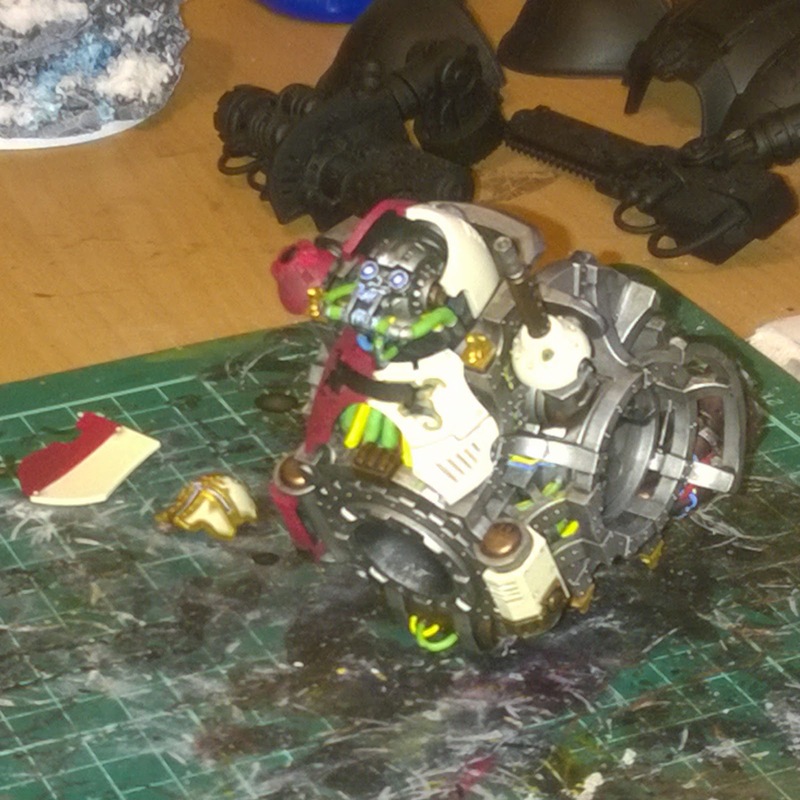 Imperial Knight Freeblade, some more WIP. Bluddtoof here after a bit of a break to plan and run Worcester War III, which I must say went really well! 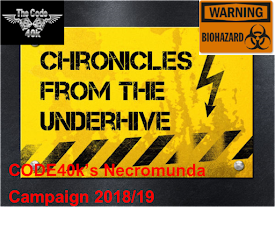 A big thanks to everyone who came and made it such a great day, Worcester War IV "The Assault on The Code" is now in the preliminary planning stage and will be held Spring 2015, more to come on that in future posts. Now on to the Knight; I started this a couple of months ago, you can see the previous posts here, here, here and here. I'm well on the way to finishing the torso and head now, the upper carapace will be painted as a separate sub assembly for ease. 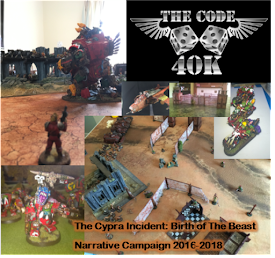 Hey guys and girls, Mike has kindly asked me to contribute to this blog so I thought I'd offer up a few words on what's been going on in my hobby world lately! 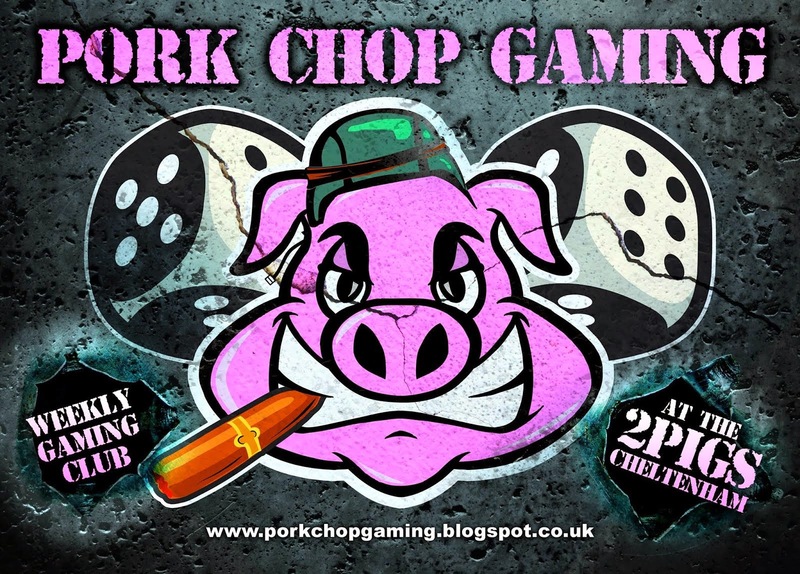 Firstly, let me introduce myself, my name is Tom Baker (no, not that one...) and I'm the guy behind the Battered Bristles Facebook page - although hopefully some of you know me better from the fabulous Worcester War tournaments I've attended the over the last couple of years. 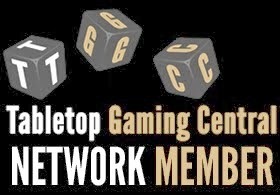 If I've had the fortune to play any of you in a game then that's excellent, if not, then hopefully I'll be able to throw some dice down with you at another tournament soon! I confess it was with some trepidation I booked for this event as whilst I enjoyed last years, I was not blind to some of the (quite fairly) abuse levelled at it. I've not been back into the hobby for that long and the 2013 event was the first my friend and I had attended in a long long time and as such, it was with wide eyes and almost childlike awe we spent the first few hours walking around looking at all the pretty things! But then it dawned on us there wasn't actually much to do or see and with over half of the main floor given over to sales, the event quickly began to feel more like a giant sales pitch. Allow me to just intercede here for one moment to clarify a quick point - I love GW. I love the models they make and the game systems they create to push thier product. I'm also acutely aware that they are first and foremost a business and their prime directive is to sell products to stay profitable and remain in business feeding me lots of shiny toys. Anyhow. Fast forward to 2014 and wow. 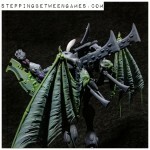 It almost appears that GW have been guilty of that Cardinal sin - they appear to have listened to their customers! Warhammer Fest sort of appeared out of the warp with very little fuss, quietly appearing as if from nowhere with everybody asking "what is this Warhammer Fest of wich you speak?". The event was completely unrecognisable to that of the previous year! Firstly - it's was calm, ther was space to move, sit and take a moment. With the event split over 3 floors, the first floor allowed you to enter the area, be gifted a program and ticket badge before heading to grab a coffe and a (nicely cooked, fairly priced) burger and grab a seat after driving for over an hour as my friend had done. Then - if you wished - you could enter the 'sales' part of the event. Behind doors, out of immediate sight, with no pressure to enter unless you wished there was a huge room dedicated to GW / the Black Library and Forge World. 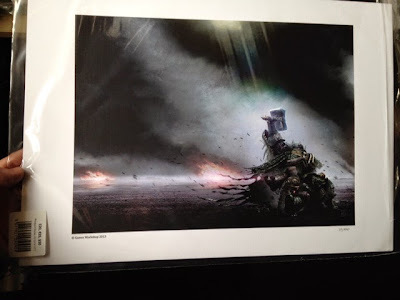 I snagged myself a nice limited print of Vulkan for my hobby room and even a (supposedly sold out) pack of limited edition data cards for the Dark Eldar for a friend. Hell, there were even about 5 or 6 gaming tablesset up, free for people to use if they so wished! The middle floor was given over to the guys and girls behind White Dwarf, showing fantastic artwork from upcoming books and magazines whilst also having many of the writers on hand with their armies more than happy to have a chat and talk through pretty much anything you cared to level at them. Again, no queuing per say, just people moving freely around taking their own time. Great. 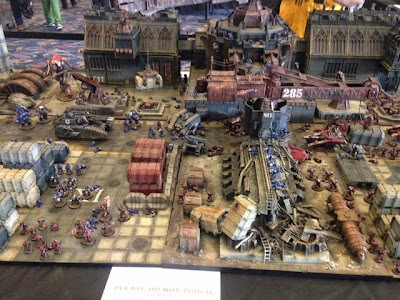 The top floor was however all about Forgeworld and boy did these guys steal the show. 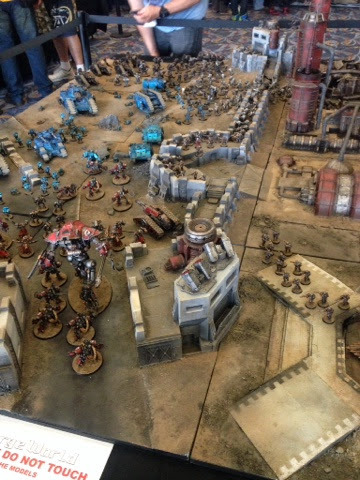 Fantastic dioramas showing the battle of Calth and a ship battle showing the Iron Hands batteling off Imperial Fist boarders really got the imagination running! There where staff on hand again all over the floor to talk about the new releases being previewed in the cabinets or holding demenstration pods to sit and explain how to do such things as 'weathering vehicles' or 'painting an army quickly'. Very quick, easy to watch videos with the actual forge world artists talking you through the steps in person. Beautifully done. 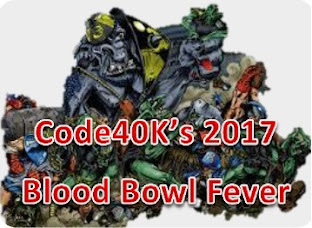 Then there was the Golden Demon event itself. The standard this year was just phenomenal - I can only assume with no other Golden Demon events running in any other country (Warhammer Fest was a UK only show) that the best of the best from around the world must have all come together on the one day because the level of entries was just outstanding. I entered a couple of models myself but against the completion I came away completely empty handed - but with a burning fire inside to create something special for next year! All told a fantastic day and I'm very much excited by next years prospects! But that's enough from me for now, if you've managed to read this far then I thank you for reading my first post in its entirety - I shall endeavour to brush up on my writing skills and post again in the near future with a sneak peek at something special I'm working on at the moment! Thanks again - until next time. 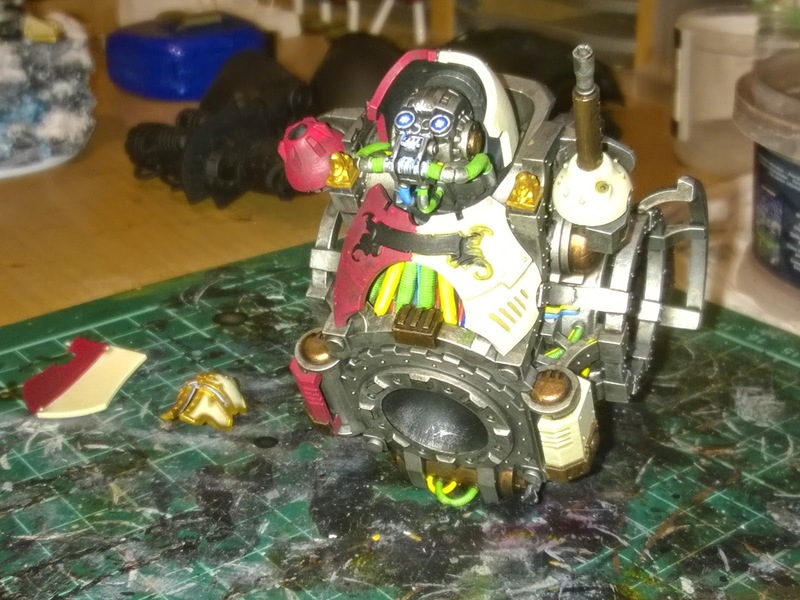 Doc back with a little post to show my new objective markers for Maelstrom games of 40K. These were inspired by Dales over on Realm of 40K here. Nice and simple barrels numbered 1-6. That should make the game easier. Using dice never works somebody always picks one up! The next thing I needed were some servo skull markers to go with my Inquisitor so I bashed these up out of the bits box and boshed them on code designs industrial bases. Shameless plug time the bases can be purchased from Worcester Wargames. Short and sweet that's all folks. Next post Ill show off some of the armies from Worcester War 3.